After a restful week off, the legislature is poised to start hearing new bills in April. CMTA lobbyists have been preparing letters and testimony to encourage lawmakers to support manufacturing. Thanks to all of you who reached out to your local elected officials and talked about your businesses! But this is just the beginning - your voice needs to be strong all year. Besides legislation, we will be watching the elections this spring through November, hearing the debates between the candidates for Governor, and taking positions on ballot measure campaigns that matter to manufacturers. Look to these pages for updates to guide your own advocacy efforts. The CMTA team is proud to represent your interests in Sacramento. Let us know how we can help you stay engaged in the process. Don't forget -- You can always use this tool to find and contact your legislator. Also sign up for our mobile text alerts and watch for our messages in April, May and June when votes and hearings go into full swing. You can do so by texting “mfgchamp” to 916-571-9360. What Matters: Time to talk to your legislator! The legislature has introduced thousands of new bills to vote on in the months ahead. We look for impacts on manufacturers and either support or oppose the bills. While lobbying legislators on those bills, we talk about the existing rules, regulations and taxes already impacting California manufacturers. The costs of doing business are already too high and the burdens grow every year. A new regulation might be well-intended to solve a real problem, but the cumulative costs of all California regulations are overwhelming for manufacturers. The high costs of doing business threaten to make many more California manufacturers uncompetitive in the marketplace. Manufacturers won’t be able to make investments and create jobs if their costs are too high. State leaders like to tout the size of California’s economy and how many thousands of jobs we have created since the end of the recession - more than any other state! In fact just today the state reported that we added 14,000 jobs last month among all sectors. That’s good, but not good enough. What really matters is how we are doing compared to other states on an apples-to-apples basis. The sad truth is that we are only attracting half the number of new manufacturing jobs than we should on a population adjusted basis. And since the recession’s end we attracted barely two percent of the country’s manufacturing investments even though California has more than 10 percent of US manufacturing. We are losing manufacturing muscle because costs are too high. If investments don’t come here, jobs will be lost in the future. So if a new bill increases the cost of doing business, even a little bit, we will do our best to tell legislators why that matters. If they are serious about protecting and promoting new middle-class manufacturing jobs, they will listen and modify their proposals. State legislators are “home” in the district next week during the spring break. You can help us lobby on the bills by reminding your legislator about the taxes you pay and the regulations for which you struggle to comply. You can use this tool to find your legislator's phone number to call. You can also use the tool to send him or her a tweet. Also sign up for our mobile text alerts and watch for our messages in April, May and June when votes and hearings go into full swing. You can do so by texting “mfgchamp” to 916-571-9360. Thanks for helping us keep manufacturing a growing part of the California economy. Taxes, laws and regulations make a big difference to your business. At the start of each year state legislators introduce hundreds of bills that could impact every aspect of your operations. You don’t need to read them all…that’s what we do….but your job is to watch our capitol updates, tweets and emails and tell legislators when they are doing the right or wrong things for manufacturers. What matters is that they learn how bills will impact your business. When legislators see engaged manufacturers as part of the solution, we will increase our chances for sensible laws and regulations. Contact your legislators – Tell them about your company - what makes you successful, what will help you create jobs and how government policies impact your business. If you can arrange it, invite them to visit your plant and meet your employees. Support manufacturing allies – Join your local regional groups and host candidates and legislators to your meetings. Another way to make a difference is a donation to the CMTA Political Action Committee. Every dollar that you contribute supports candidates who will be in a position to influence laws that impact manufacturing in California. Make us better lobbyists on your behalf - Your experience in the real world of manufacturing from tax and workers’ compensation to air quality to energy issues make you an expert in how the laws and regulations affect your business. Join a CMTA policy committee where we decide what bills to oppose or support. Visit our website to learn more about the policy committees and how you can be involved. Build the army – Thousands of manufacturers don’t yet belong to CMTA. We can make a big difference if these companies join the fight. Tell other companies about CMTA and multiply our influence in Sacramento. Use CMTA’s tools to engage when it’s most important – Sign up for mobile text alerts by texting “mfgchamp” to 916-571-9360. CMTA will only send a few key issue alerts by text per year. The links in the text will always be mobile-ready too … or sign up in the red Champions box at cmta.net to get alerts by email. Follow CMTA’s twitter @cmta for important tweets to retweet. Manufacturing matters to California. You and your employees can tell the stories and deliver the messages that will make a difference. Now is a great time to start! CMTA never stops fighting for manufacturers in California's Legislature and regulatory agencies. One of the biggest challenges is keeping advocacy at the forefront of manufacturers’ thoughts and actions throughout the year. We need manufacturers to engage on the most pressing issues in the Capitol so policymakers hear from the companies that invest in California and high wage jobs. We encourage active participation in CMTA's Champion advocacy engagement campaigns that range from contacting a legislative office or simply tweeting your company's concerns over an issue. This week you should show your support for cost-effective climate change policy and a well-designed cap-and-trade system. There will be an important vote soon on cap-and-trade and we need a chorus of manufacturers driving home the necessity of cost effectiveness in reaching California's new and demanding 2030 climate change goals. 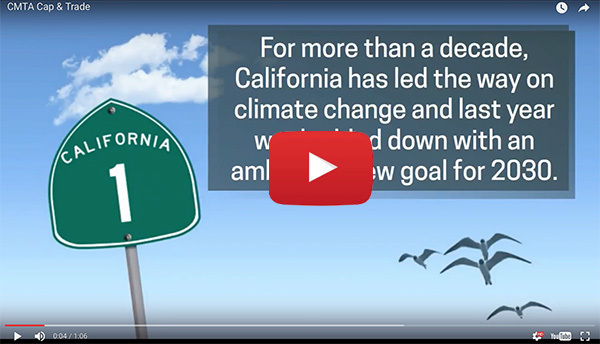 Click below to watch our 1-minute video on cap and trade and engage on the issue.